Designed by Kristin Alexander Tidwell and modeled by Aislin Freya Pax, this recycled textile evening gown looks fit for a queen. It was created for an Alice in Wonderland-themed fashion show benefit last year. Sydney Velazquez models Ansusinha’s Thai-inspired skirt at the 2017 Charleston Fashion Week. Traditional Japanese sashiko stitching influenced the fabric for this jumpsuit. Inspired by the texture of tweed, Ansusinha’s super soft, oversized cardigan is made with baby alpaca wool. Here, she pairs it with an alpaca top and block-print wrap pants inspired by those worn by Thai fishermen. Modeled by Faye Foley, this brocade slit-neck dress is indicative of Kim’s aesthetic. She loves brocade fabrics for their weight and ability to uphold structure and spends a lot of time in search of the perfect fabrics. An underlayer of silk crepe back satin in silver and blue ombré peeks through black lace in this elegant evening gown modeled by Aislin Freya Pax. The cinched back and blue frilly collar further embellish the design. Tidwell enjoys showing at collaborative fashion events. The merino jersey pants and crop top were presented at Asheville Fashion Week. The die-cut petal dress appeared at the Wonderland Fashion Fantasy benefit in Asheville. For this Japanese- inspired silk vest, Kane employed the arashi shibori dye technique, which utilizes a pole or bamboo as the resist to produce striations reminiscent of storm-driven rain. The shot was taken for a book, Organic Portraits. A multilayered swing coat features silk shibori pieces and channel stitching. Various dying techniques are incorporated into this collaged blouse. A model shows off Brooke’s own high-neck, fit and flare wedding dress she made for herself using a French lace that has sterling silver thread woven into the fabric. Model Morgan Purdy wears a Grecian-style gown made with a silk modal blend and plant-based dye. The semi-sheer draping fabric is form-fitting and soft, a style indicative of Brooke’s special-occasion gowns. Growing up, Allyson Ansusinha used to love going to her grandparents’ Midwestern, mid-century house. Natives of Thailand, they mixed traditional woven Thai textiles into their Danish modern surroundings. That blend of reverence for traditional woven cloth and streamlined design still influences Ansusinha today in her work as chief designer at Echoview Fiber Mill in Weaverville. That interest took on a new scale and meaning when she moved to Asheville in 2014 and started working for local clothing company Appalatch. She learned to operate the company’s computerized knitting machine, which uses digital drawings to produce a fabric structure. When the company moved in a different direction, they sold the machine to Echoview Fiber Mill, and Ansusinha stayed on to develop products for the mill. In her knitwear designs, she emphasizes the combination of handmade and industrial fabrics. “It’s a lot of experimentation and problem solving,” she says. 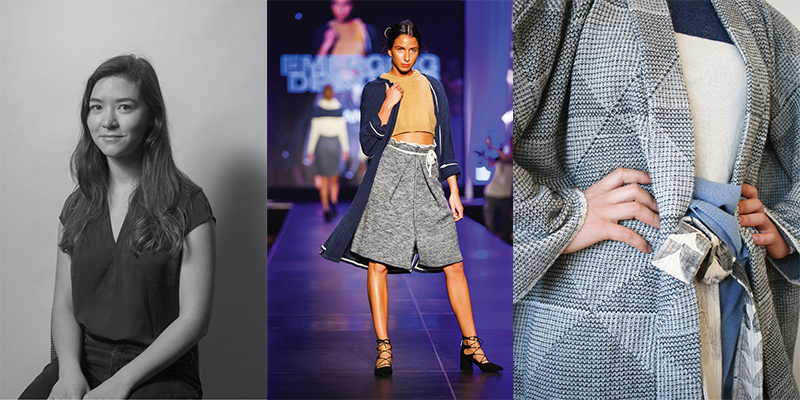 Last March, Ansusinha introduced Echoview’s first knit fashion line at Charleston Fashion Week, where she was a finalist in the Emerging Designer competition. “I’m really interested in how clothes wrap around the body; clothes that can grow with a person,” she says. Sustainability is also important: She uses natural fibers and dyes as much as possible (or no dyes at all). “The fashion industry is the second biggest polluter,” she says, adding that she’s more committed to sustainability as a business value than as a brand that’s promoted to consumers. Ansusinha’s designs are available in Echoviews’ newly redesigned retail store and on the company’s website. She’s currently working on next season’s women’s wear. The work she’s doing, Ansusinha says, is an extension of the long tradition of the textile business in Western North Carolina—she’s just putting a new spin on it. Scout Boutique in Asheville’s Biltmore Village will showcase new Echoview designs at a trunk show on September 14. For more information, see www.facebook.com/scoutboutiqueasheville. Find more of Ansusinha’s work at www.allysonansusinha.com. When she moved to Asheville six years ago, Angela Kim brought along her sense of style: a love for dressed-up, feminine looks she developed living in big cities such as Seoul and Auckland. Here in laid-back Western North Carolina, it wasn’t immediately apparent that others shared her taste. Having spent much of her career working for medium to large fashion brands such as Gap and JC Penney, in roles from production to merchandising to design, she didn’t find an ideal fit for her work experience here, either. So she did what many before her have done upon moving to the area: She struck out on her own, starting Angela Kim Designs in 2015. “I’m a dress girl,” she says. “I wear dresses all the time. I didn’t want to make things that I wouldn’t wear, so I stuck to what I’m good at.” Elegant with an emphasis on gorgeous fabric, fit, and drape, her first collection debuted at Asheville Fashion Week later that year with a whopping 35 designs, all sewn by Kim herself at her parents’ home in Seoul. “I’m used to big collections,” she says. To her surprise, she found out there is a market for dressy, “girly” designs in Asheville after all, some of it fueled by tourists. Although Kim didn’t want to mass produce, she needed to bring in some help with the sewing to go forward and grow and market her business. Her ready-to-wear designs—available on consignment at local boutiques and through her Etsy store—place an emphasis on quality fabric and exquisite tailoring. “Fit is the most important element,” she says, but fabric plays a big part too, and she sources it from all over the world. “It has to feel good on your skin” to make you feel good wearing it, she says. Kim’s most recent venture is Asheville Couture, a custom bridal and elegant occasion line shown at Wedding Inspirations in North Asheville. And she’s recently launched a new mother-of-the-bride collection, emphasizing perfect fit and beautiful fabrics. The line will also be available through Wedding Inspirations and will be showcased in an October fashion show (check weddinginsp.com for details). To see more of Angela Kim’s designs and learn about her upcoming fashion events, visit www.angela-kim.com or www.ashevillecouture.com. Her next fashion show will be held in late October at Wedding Inspirations in Asheville. See weddinginsp.com for details. Tidwell’s approach developed during her work in theater and television in the United States and England. Among her many positions in the field, she worked in costuming at the Santa Fe Opera and Chicago Shakespeare Theater and served as the props director for the Denver Center Theatre Company, overseeing 16 productions a year. She was part of a costume design team that received an Emmy nomination for the daytime drama Another World. These experiences helped her develop the practical skills of sourcing materials and learning how they worked on the body, but also an invaluable sense of artistic collaboration. After her daughter was born with developmental challenges, Tidwell needed a job with more flexibility and began working with baby products company Boppy, becoming their product designer and developer. Her job involved ensuring brand fit when bringing new products to market, something she still does as a consultant today, helping entrepreneurs develop everything from athletic shoes to hats. In 2010, Tidwell seized on an opportunity to move to Celo in Yancey County. Being tucked away in the mountains didn’t stop her work all over the country, and it also opened up new ways to apply her experience locally. On the business level, she’s been a design partner for the Carolina Textile District, an initiative to encourage entrepreneurs to make their products in the US. On the artistic level, last year she was asked to participate in an Alice in Wonderland-themed fashion show to benefit Eblen Charities and Appalachian Angels of WNC. 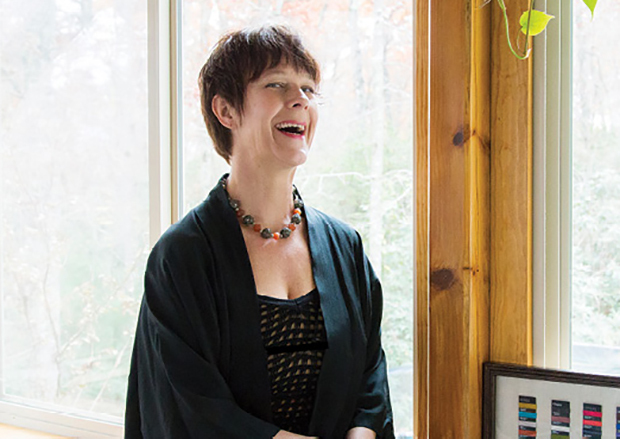 The show led to connections and collaborations with local models and stylists, and she later created designs for the Faerie Arts Festival and the Color Me Goodwill fashion show in Asheville. The actual garment is only one part of Tidwell’s vision that can be seen in her work. She strives to source sustainable materials made from low-waste processes. For fashion shows, she works for inclusion and diversity in the models who wear her designs. All of it is part of the “Be Well” essence that she tries to reflect in her creations. While Tidwell has big-league experience, she also loves the cross-disciplinary collaboration that comes from working in a small community like Western North Carolina. “I love it when people come together to create a collective vision,” she says. Learn more about Tidwell, including upcoming events and services, on her website www.kristinalexandratidwell.com. The rest of the fashion world is just starting to catch on to what Asheville designer Michael Kane has known for decades. Fast fashion—cheap, disposable clothes found in so many big-box stores—isn’t only bad for the planet, it doesn’t really satisfy our needs. Fashion is a form of self-expression, and something that’s made for a mass market doesn’t suit individual taste. Instead, Kane urges his customers to “collect your closet.” In other words, a wardrobe can be like any other art collection—carefully considered and curated, chosen for the long-term as a reflection of personal style. For nearly three decades, Kane has created wearable art for the artisan market—that is, the niche that straddles art galleries and boutiques. His shibori, hand-painted, and airbrush designs on silk range from minimalist to expressionist, a reflection of his early artistic bent toward painting. But unlike painting, there’s a certain element of surprise in shibori that’s out of the artist’s control. That’s fine with Kane. This process, developed in Japan, involves using clamps, pipes, and boards to help create designs in hand-dyed fabric. The artist can manage the process up to a point, but there’s always a bit of variation: Each piece Kane creates is completely original. He does almost all the work himself, relying on two seamstresses to help out part-time. There’s a kind of freedom to that way of creating. “I do what I want to do and what I like to do,” he says. Twice a year, he shows 200-plus designs in New York during Market Week (the week following Fashion Week), where buyers purchase directly from him. 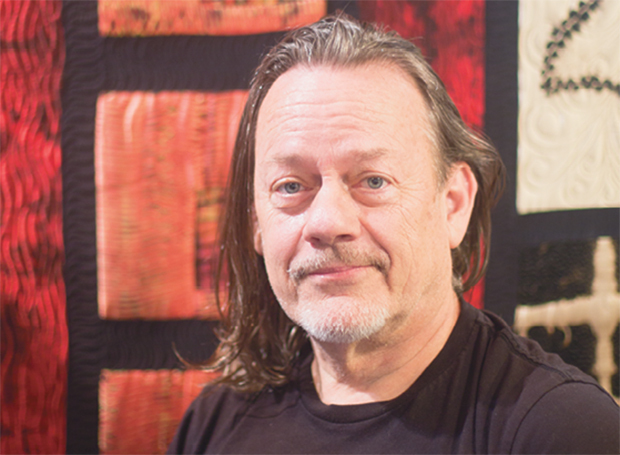 He also creates custom designs for clients and shows and sells his work in his West Asheville studio. Before the recession, Kane says his work was more dressy, aimed at special occasions. But times have changed. His designs are more “practical” now, he says. Younger women increasingly have an appreciation for pieces made with the kind of care and attention to detail seen in Kane’s work. They’re more inclined to invest in a beautiful, individualized piece that “tells a story,” Kane says. They also appreciate the idea of fewer pieces that are more beautifully, sustainably made — a kind of fashion whose time has come. Kane’s wearable art pieces are sold at select galleries and retail shows across the country, and locally at Bellagio Art to Wear. His West Asheville studio, located at 735 Haywood Rd., is open by appointment. See www.michaelkanestudio.com for details. dresses and brides looking for “garments that tell a story,” she says. In the past few years, though, Brooke has experienced a series of highs and lows that took her life and her work in wholly unexpected directions. The birth of her son, Harper, in 2015 infused her life with joy. But not long after, her husband, Ryan Conrad, a beloved local yoga instructor and community cornerstone, was diagnosed with pancreatic cancer. Brooke closed Ship to Shore while caregiving. After Ryan passed away in February 2017, she decided to give herself six months to transition back to business, and she’s working from home now to spend more time with her son. “I’m putting energy toward powerful ceremonial passages,” Brooke says. “We don’t make a lot of room for that in our culture.” She sees the wedding dress as part of the transformation a bride will go through in making a new life commitment. “It’s a costume for your love,” she says. In the spring, she’ll introduce her ready-to-wear line of wedding gowns in a few small boutiques in the Southeast. While each dress will be one-of-a-kind, it will be available off-the-rack. 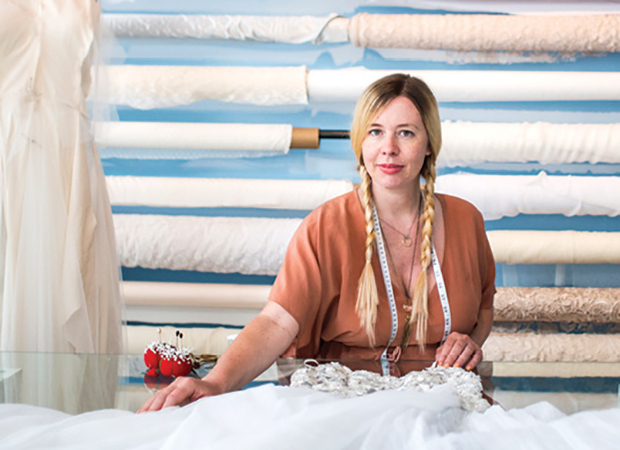 She’s designing for “the same client who’s been coming to me for 15 years,” she says. “Someone who wants to wear a poem, who wants a fairy tale attached to the whole experience. Someone who wants a soul connection to the garment.” Her first new dress in years is in progress now, designed in collaboration with a friend’s four-year-old daughter and envisioned as the kind of costume her alter ego would wear. Brooke’s current way of working is about “dreams and having fun and being with the ones you love,” she says. It’s a new approach for a new life, different but always full of spirit and creativity. Priddy’s one-of-a-kind wedding gowns will be available for purchase off-the-rack in select stores starting in the spring. See www.shiptoshoreshop.com for updates and availability.